Want to optimize Windows 10 for login time? Would you like to speed up Windows 10 by disabling unwanted services and turning off scheduled tasks? Here is an excellent piece of software to optimize Windows 10 and earlier versions of Windows. VMware OS Optimization Tool is a free software for Windows 10 and earlier versions of Windows operating system. According to VMware, the VMWare OS Optimization Tool helps you optimize Windows 10/8/7 systems for use with VMware Horizon View but the tool can also be run on any Windows 10 installation to optimize and tweak the operating system. 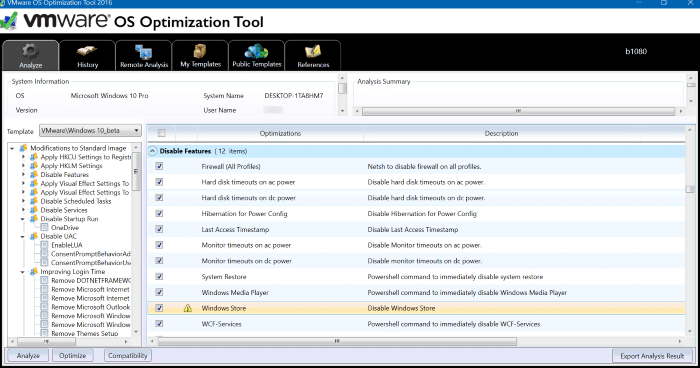 In short, VMware OS Optimization Tool can be used to optimize and tweak both virtual and physical Windows installs. In addition to Windows 10, VMware OS Optimization Tool supports Windows 7, Windows 8, Windows 8.1, Windows Server 2008 (including R2) and Windows Server 2012 (including R2). 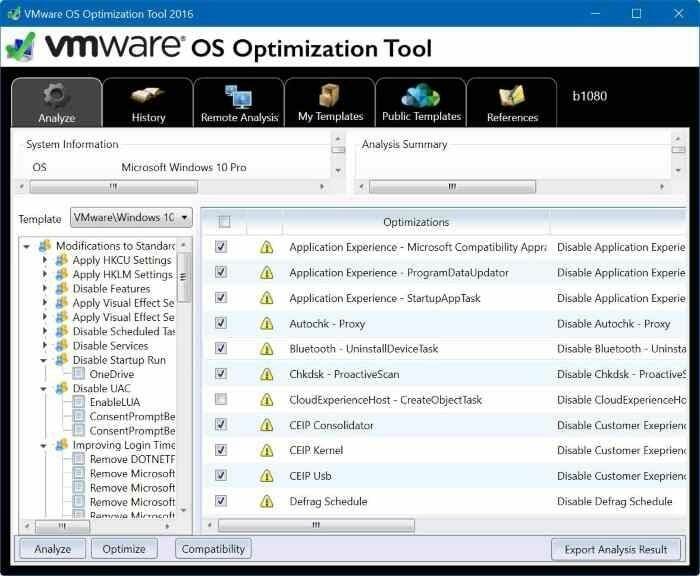 The VMware OS Optimization Tool is one of the best free tools out there to optimize your Windows operating system in no time. While the user interface is not perfect for beginners, the tool is one of the most advanced Windows optimization software out there. The OS optimization Tool, as you can see in pictures, offers a total of five tabs: Analyze, History, Remote Analysis, My Templates, Public Templates and References. Use the Analyze tab to analyse all services, scheduled tasks and registry entries. The History tab allows you optimization history and allows you restore your Windows install to a pre-optimized state. You can find built-in optimization templates under Templates tab. You can also create your own optimization template here. The five built-in templates come with their own set of modifications. The default optimization template for Windows 10 can disable number of features, remove default apps, disable scheduled tasks, disable startup run and improve login times. Step 1: Visit this page of VMware to download the newest version of VMware OS Optimization Tool zip file. Extract the zip file to get VMwareOSOptimization Tool folder. Open up this folder to see the executable. Step 2: Run VMware OS Optimization executable to launch the tool. The tool automatically detects the current version of Windows and displays the best built-in optimization template. Step 3: Verity the list of optimizations suggested by the template. The default template has hundreds of options. We recommend you read each and every optimization carefully before selecting or deselecting an optimization. Step 4: Click Optimize button to optimize Windows operating system. Overall, VMware OS Optimization Tool is an advanced to optimize Windows operating system. That said, the tool is not meant for novice users who want to speed up Windows operating system. 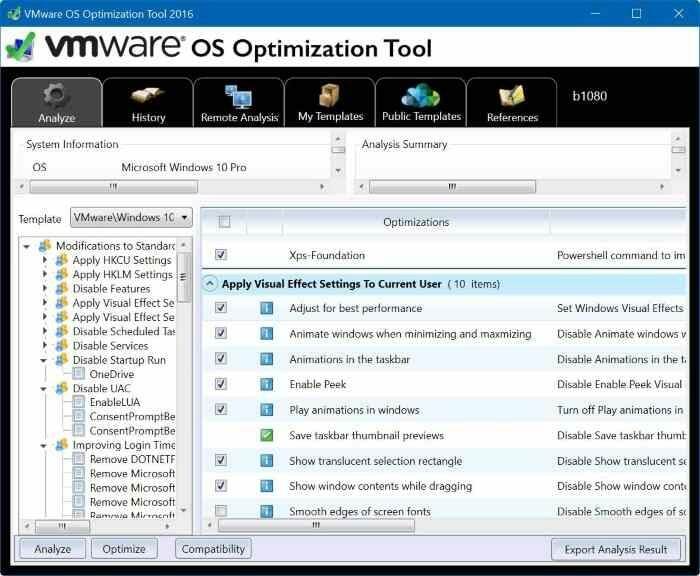 If you’re interested in this free tool, we recommend you download VMware OS Optimization Tool guide PDF to know all the features and learn how to effectively use this software for best results.